How many people speak Bulgarian in the actual country? 7 million? Ah, but how many have foreign in-laws? At first I thought it was a package of processed meats. Obviously I have visual comprehension issues. To be boringly pedantic, I suppose the entire "teach yourself" series has sold 40,000,000 units covering dozens of languages, although that still sounds like an inflated claim to me. 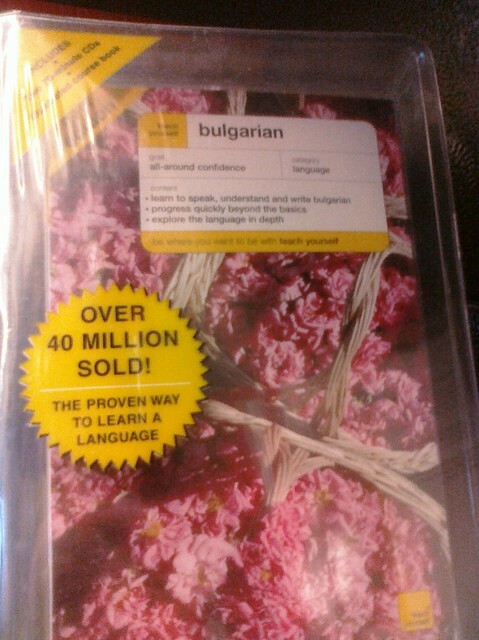 The image on the box is of baskets of roses, because Bulgaria grows them for the perfume and cosmetic industries. There's your fun fact for the day! Perhaps it's the next hot tourist destination?